So this month's Beauty Box 5, has some good stuff. I'm not going to say great stuff, because I haven't had a chance to try out everything yet (the mask, and the body wipes to be specific). Sorry if the pictures look super bright. I took these pictures with my ring light. As usual Beauty Box 5 gives you a card describing everything in their monthly box, which is good for those of you who aren't sure what it is exactly you receive in your box. Cattiva Presisione Eye liner- This was the thing I was most excited about getting in this month's beauty box 5. I'm a sucker for eye makeup, especially if it's eye liner. I wore this out today, and it lasted a good time! A bonus is that this eyeliner doesn't need a sharpener! Masker Aide Hydrating Facial Sheet Mask- This mask looks pretty interesting. Granted I haven't had a chance to try it out yet, because it is just one mask, but I will try out this mask soon. Stay tuned on Instagram for further updates! Harvey Prince Hello Perfume - Omg, omg, omg! I love this perfume. It smells like summer! It has hints of lemon, mandarin, grapefruit, forsythia, and plumeria. This scent is perfect for those days where I'm going out, and need a little kick to smell amazing! Ban Total Refresh Cooling Body Clothes- This looks like a really cool concept! I haven't had the chance to try them yet, but I will let you guys know on instagram how I like them. H2O Plus Aqualibrium Marine Cleansing Gel- I tried this out a couple of days ago, and this cleanser is very refreshing. It doesn't foam up, and it feels great after a long day! 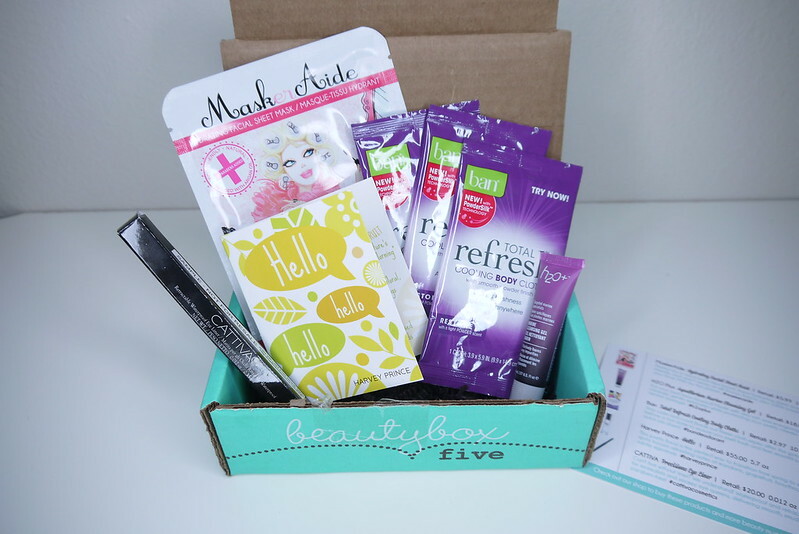 What do you think about this month's Beauty Box 5? I personally really love the eyeliner, and the perfume! Looks like you got some awesome goodies. Oh I can't wait to hear about that face mask. My favorite thing just from looking at the contents from your post...The eyeliner. Hands down! I bet it's fabulous. Oh my your description of that perfume makes it sound so appealing! !